Beautiful 2 bedroom studio detached from the main home. sleeps 5! Enjoy island living at its best in this plantation style home. Think the historic "Pioneer Inn". Double bedroom unit with a covered outdoor kitchen, large deck and BBQ area, and gazebo Dining area included. The "Palm Tree" double bedroom unit: First bedroom consists of 1 king bed, 1 queen futon-sofa bed and full bathroom. The second bedroom has 2 twin beds (converts into a king bed if desired), 1 queen futon-sofa bed. This double bedroom unit sleeps 5 (2 adults, 3 children) comfortably children must me no older than 14,15 and up are considered an adult. This unit has it's own private entry, air conditioning, ceiling fans, WiFi, 2 flat screen 32" TVs. A full covered outdoor kitchen (with full size refrigerator/freezer, gas 5-burner barbecue, granite countertops, stainless steel sink, microwave oven, toaster oven, cooking utensils, dining settings), outdoor shower, 6-8 person dining gazebo. Completely outfitted with every beach toy and equipment one could want. Prices start at $295 per night seasonally adjusted. Rates start at $295 per night based on weekly rate. I was raised in Newport Beach, California and our family always took vacations to Oahu and I fell in love with Lanikai. I owned and operated a mobile food delivery service and cafes serving businesses in Orange County and Los Angeles that fed a hundred thousand business people daily. In 1996, I was awarded Businesswoman of the Year for Orange County. That same year, I retired, sold my business, and made a life changing decision to move our family to Hawaii. I came to Lanikai as a little girl and it was always my favorite area and beach on any island. As I was growing up, our family usually went to Hawaii for our summer vacations. This is how I discovered the then hidden gem known as Lanikai. It became my lifetime goal to build my dream estate and raise our four daughters in Lanikai. Now that they are all grown up and I have a lot of room, I am able to share the awesome beauty of Lanikai with the world. My guests come first. I make sure they see all the amazing things on Oahu and am there for them 24/7. Convenient use of Lanikai Beach - rated #1 beach in the world. Also recently rated #1 family beach, with its powder-like white sand and calm, clean turquoise water. Our plantation-style residence was built to look like the original Pioneer Inn in Lahaina, Maui. It is not a LA type home. We offer more amenities - kayaks, surfboards, boogie boards, beach chairs, beach mats, beach towels, coolers, 86-jet hot tub, dining gazebo, free wifi, etc. - than any other rental in Lanikai. There is a unique outdoor kitchen that is fully equipped with a burner gas barbecue. Ample parking is provided for all units. toilet, combination tub/shower, outdoor shower, Outdoor shower is in addition to tub/shower in bathroom. Pillbox hike and Lanikai hillside in clear view. 896 ft as a bird flies to the #1 in the World private beach of Lanikai, Kailua. OUTDOOR kitchen with granite countertops, stainless steel sink, full size refrigerator/freezer, 4-burner gas barbecue, wine/beverage cooler, microwave oven, toaster oven, George Foreman grill, blender, plates, dinnerware for 12. Tropical ceiling fans, microwave/toaster oven/mini-refrigerator/coffee maker, gazebo with dining table/chair, large open deck w/ outdoor gas grill, umbrella covered lounge chairs/table, kayaks, surfboards, beach chairs, beach mats, snorkel gear, boogie boards, masseuse available on call, personal laundry service, discount to highest rated luau in the state. Mahalo for staying with us! We enjoyed accommodating you and your family. I’m glad that the space worked out for you and your family. The space as I mentioned earlier on is best with 2 adults and 3 children (children under 13) Due to the arrangement of the units. Thank you for leaving a review! There are more units available if you ever return and need a little more space for your party size. I can't recommend this place enough! I stayed in this unit for a week with my husband and friend. The space was plenty with two rooms and indoor space to hang out/ watch movies. We used the outdoor kitchen/ eating area nearly every night and every morning. It was the perfect place to decompress after a busy day. The kitchen is well equipped with everything you'd need and Lori was happy to provide us with any additions. We mostly used the grill. I also loved the outdoor shower. 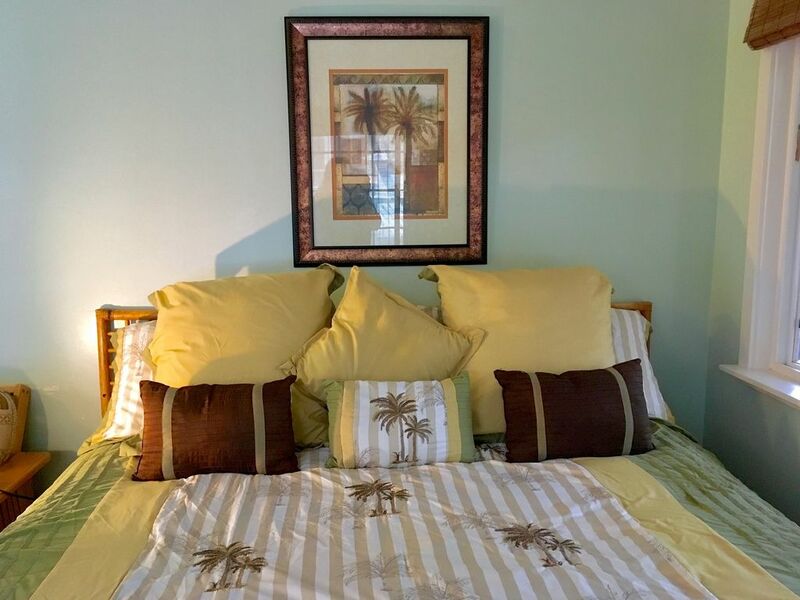 The unit is in Lanikai and a 1 minute walk to a beautiful beach. We used the kayaks at the house to go to the Mokes which saved lots on rentals! Lori and her family were wonderful and made our vacation so special. Their recommendations on places to go and things to do are unbeatable. I hope to return to Oahu soon and will most definitely stay here again! Looking to truly enjoy the Lanikai experience? Lori's place is where you want to be! Gorgeous house on the "quiet" end of Lanikai, you are only steps away from the kayak launch at little beach. Few blocks down to get to the start of the big beach access paths. Everything you need for fun in Kailua Bay is at hand at Lori's - kayaks, snorkeling gear, beach chairs. Perfect place for a get-away and Lori's the perfect host! Thank you for the kind review! I love what I do and enjoy sharing my home with great people! I am happy you all enjoyed yourself and had a fun trip. Come back anytime! We had a lovely stay in Lori’s double unit in Lanikai. The unit has two rooms with a bathroom with shower and an outside kitchen. There is also another shower outside for after the beach. The unit was clean and comfortable. Lori and her family were great hosts with a wealth of information about the area and on local spots to dine. Lanikai is an exclusive beach on a no exit road . The sand is great and the water warm. During our stay in June there was at times a brisk on shore wind. This location made for a peaceful, safe and relaxing holiday. This is good property to stay in if you want 15 min walk or short drive to private beach area that is not too crowded with all the tourists. Nearby town is small but it has everything you need. If you plan to visit a lot of the tourist landmarks, don't stay here. Everything is about 40 min to 1 hr drive from here so I would not stay in this area, stay close to Honolulu somewhere. I did not like few things at this place but that may be different for you. Here are some Pros and Cons, this is my honest opinion to help the next person booking a trip to Oahu. - The property owner, Lori, is very helpful and she is a great host. She will help you in any way possible and she has beach toys available for use. - Lori is available 24/7, you can just walk up the stairs and knock on her door for help. - This property is in gated area so I felt very safe. - 5 people can sleep very comfortably. - Beach is walking distance but you cannot see the ocean/beach from this property. - Not much privacy here, patio/yard/Jacuzzi area is in the front yard of the property owner. If I had known that, I would not have stayed here. For some reason I thought the yard was private area so maybe I needed to look carefully, lesson learned for next time. -One of the AC units is in the bathroom so you have to keep the door open to get cold air in the room. All the bathroom smell, goes in the room. If someone is using the bathroom, no cold air in the room. when it's 90 deg outside, room gets hot quick. -Too many bugs and critters at night, my family did not sit outside because they were afraid of all the bugs. That ruined the whole family experience of hanging out outside. -BIG reason for picking this place was the Jacuzzi but it was broken so we never got to use it. We should be given some discount but I don't think that will happen. I am sorry to see such a less fortunate review. I have been renting this same unit for over 20 years and I have had nothing but love for the place. I appreciate your honesty, from your opinion. Lanikai is a location that people will pay extra to stay in, so when you say "If you plan to visit a lot of the tourist landmarks, don't stay here. Everything is about 40 min to 1 hr drive from here so I would not stay in this area, stay close to Honolulu somewhere." This statement is not the best advice you could give people coming to Oahu for a vacation. Honolulu is congested and you will get stuck in traffic resulting in the same 40min drive to these destinations. The unit is on the same property as the owner. This is included in the description of the property. I have it set up with its own entrance, parking spot, jacuzzi, bar-b-q, outdoor kitchen, and dining gazebo. I'm not sure how much more privacy you were looking for? Thit unit has 2 AC units in it, we do this for backup on the extra hot summer days. The one built in AC unit is enough to keep the two bedrooms very cold. I do kindly ask my guests to turn off the AC if they will be gone for over 4 hours. Bugs and critters are everywhere in Hawaii no matter where you go. This has never been an issue for my guests and their use of the gazebo, jacuzzi, and bbq. Please read previous reviews of how the guests LOVED the outside area. I have checked both TV's in the unit and they are working fine. Jacuzzi broke during previous guests stay and is repaired. The owner is on the property as it says on our site. Please read the other reviews we have since there are several to get a better idea of the rental. I show a thing we call ALOHA to all guests regardless their reviews. It is unfortunate to get a review like this, especially after giving a lot of time and energy trying to set you all up with discounted tickets to luaus and tips on where to go. I hope you made it back safely and made some fun memories on Oahu with your family. We found new family ! We arrived in Lanikai not for vacation but to look for house and school for our kids. We stayed with Lori for 10 days and this was best decision we could have made. Her hospitality and willingness to help us find out as much about the area as possible was like talking to your own mom. We loved the accommodations as well. when home, Kids spend most of their time in the hot tub and had great time. We used kayaks and toys provided by Lori, she was fantastic for our kids and made us feel like visiting family rather than renting VRBO. Her outdoor kitchen had everything you could ask for and we used it to cook. Her house is located just 5 min walk from one of the most beautiful beaches. There is a 2 mile loop around the Lanikai community that you can run every morning if you like to run. Our kids called her auntie Lori after 3 days being there. This is one of the best places to stay in this area. We will definitely recommend her rental to anyone who is looking to spend time in Lanikai. There is no where in the world that offers the beauty a simple visit to Lanikai beach will bring. The worlds finest powder sugar beach. Kayak rides to world famous bird sanctuary and famous hikes to world war 2 pillboxes. A great way to start your day is a simple walk or jog around our 2,25 miles private Lanikai loop. Kailua town is 1 mile away. Monthly rates do no apply for summer months and Christmas/New Year months. This is a quiet residential neighborhood. NO loud music or noise after 10p or before 7a.